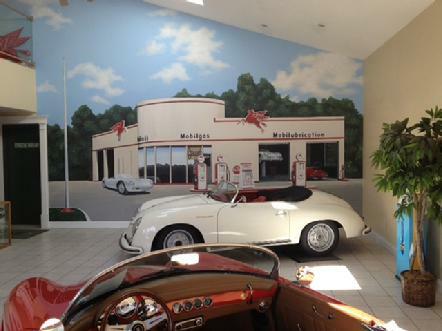 Ever since my son, Carey, and I first discussed our new building he wanted a showroom with a period influenced mural. Finally, in 2011 t his desire come to fruition. 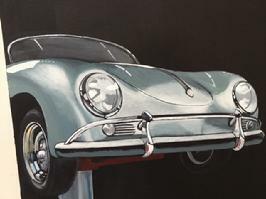 A close friend of his, Brandon Hochstettler, is the artist and, between the two of them the 1950's Mobil Station came to life. At 20 feet tall and about 24' long, this vintage filling station scene is a beautiful piece of art that complements our product line and adds a nostalgic touch to our showroom environment. 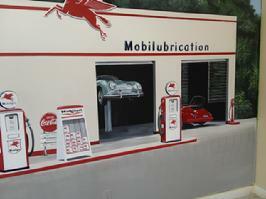 It features BECK Speedsters in the service bays, and a BECK Spyder® waiting to get to the pump. We enjoy this every day and have received countless comments on it. Look closely and you can see the "reflection" of the red gas pumps in the bumper over riders!